I've had good experience with PIAA – SUPER SILICONE WIPER BLADES. The best windshield wipers are all available online and we've scoured the internet for the best wiper blades for all different types of needs and budgets. Thanks to the Internet, you don’t necessarily have to walk into your local auto parts store to purchase the best windshield wipers. There are plenty of online retailers that carry an assortment of popular brands, allowing you to browse and compare different products and their pricing with ease. Some sites also offer you a way to select your vehicle, so you can make sure the wiper you’re purchasing fits your car. The Bosch ICON is a beam-style wiper blade and features a bracketless design with tension springs, helping keep the blade flexible while providing superior performance in all weather conditions. The company claims the ICON offers up to 40-percent longer life than other premium blades and its blade rubber was proved to be the most resistant to cracking from exposure to ozone compared to other major competitors’ brands. It also features an exclusive asymmetrical flexible spoiler design for effortless and quiet wiping. Bosch also promises the ICON is easy to install, thanks to a weather-shield double-locking connector. While generally more expensive than other wipers available on the market, the Bosch ICON is considered the best by many of its users, although they may not necessarily be the best for you. If you live in an area that doesn’t experience a lot of rain or snow, you may not need a premium blade like the Bosch ICON. But if you like knowing you have one of the best performing wipers when it does rain or snow, then the Bosch ICON should be towards the top of your list. Bosch wipers are also used as OEM equipment on various luxury German vehicles, such as Audi, BMW, and Mercedes-Benz, so you know it’s a quality product. 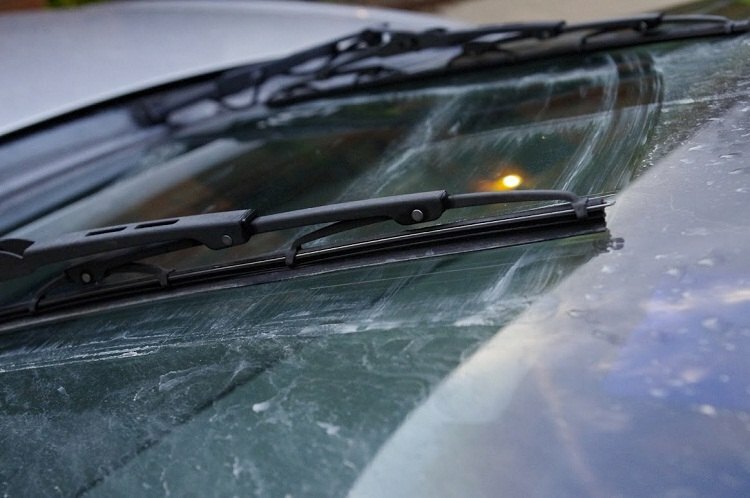 PIAA offers silicone wiper blades that claim to be twice as durable as traditional blades. The silicone compound also promises greater visibility by coating the windshield with silicone, helping promote continuous water beading in inclement weather. PIAA’s silicone wipers are available in three different models: Aero Vogue, Super Silicone, and Si-Tech. Both the Aero Vogue and Super Silicone wipers are compatible with Silicone refills, potentially saving you money in the long run if you’re comfortable with using refills. The available options cover the three different types of windshield wipers, so there’s a real good chance PIAA offers something that meets your needs. The PIAA Aero Vogue lineup is a hybrid blade which incorporates the benefits of a traditional frame with that of an aero-style cover, featuring “Pass Through” technology that greatly reduces blade chatter and wind lift at higher speeds. The PIAA Super Silicone uses a traditional exo-frame design that has been enhanced with additional pressure points to provide a smooth, clean, streak-free wipe with easy installation. The Si-Tech lineup uses a flat-blade frameless design, which contours to the shape of the windshield to provide equal pressure points across the blade for even wiping. They are also designed to reduce snow and ice buildup during winter, making them a great option for those in colder climates. All PIAA wipers come with a one-year warranty and are subjected to durability testing that follows the strict Japanese Industrial Standard (JIS K6301) method for physical testing of vulcanized rubber. You may have heard of Rain-X before, a brand that specializes in glass water repellents and cleaners. The original Rain-X glass water repellent dramatically improves wet weather during visibility, but it’s not a substitute for high-quality windshield wipers. That’s why the company offers the Latitude Water Repellency 2-n-1 wiper blade, which features Rain-X water repelling coating that is transferred from the wiper squeegee to the windshield during initial use. The beam-style blade offers the best performance out of all Rain-X offerings and is generally more affordable than the Bosch ICON and certain PIAA Silicone wipers. But since it is a beam-style blade, it isn’t as durable for all-weather performance, so you will want to keep that in mind if you live in an area that experiences snowfall. The Rain-X Latitude Water Repellency blade doesn’t have any type of extra casing to prevent clogging with ice and snow. The wiper blades come pre-installed with a universal adapter to make for easy installation, with the company claiming the adapter fits 96 percent of all vehicles on the road. The blade itself contours to the curvature of the windshield, with a synthetic-blend rubber squeegee featuring a premium graphite coating designed for enhanced durability in rain and sleet. Another beam-style option comes from Aero, which offers a six-month warranty on its products. They are billed as direct OEM replacement wipers constructed with a specially blended rubber for a smooth, clean, streak- and chatter-free wipe. The Aero Premium All-Season wipers also feature a flexible spine design, which is said to fit the windshield better for superior windshield contact. Unlike some of the other wiper blades available on the market, Aero’s replacements can be purchased as a pair, making them a cost-effective option. Since they are more affordable, however, don’t expect them to perform as well as higher-priced competitors. They offer good all-season performance, but there are better options for snow and ice. Some would say Aero’s wipers are the most “boring” of the lot, with no special selling points or qualities that make them stand out from the crowd. They’re ideal for drivers who live in an area with moderate rainfall and aren’t convinced they need to spend a significant amount of money for better blades. Most owners are satisfied with the performance of Aero Premium all-season wipers given their price and found them easy to install. Other users found that in certain weather conditions, the wiper blades don’t last as long as some competitors. Always keep in mind your weather conditions when choosing the right blade for the job. Michelin is likely a name you recognize in the automotive world as a major tire manufacturer. But the company also offers a wide range of wiper blades of all styles, including beam, hybrid, conventional, and even specific applications for a rear windshield wiper. If you’re looking for a hybrid wiper blade, the Michelin Stealth Ultra hybrid wiper blade is a popular choice, with a unique patented design featuring exclusive “Smart-Flex” technology that adapts to the curvature of a windshield for better wipes and improved vision. Premium rubber with advanced coating delivers smooth and quiet wipes in all weather conditions, while a segmented hard cover provides maximum flexibility and protection from snow and ice. Installation is also straightforward with Michelin’s “EZ Lok” connector system. It’s worth noting however, that numerous owners have found the included adapters aren’t compatible with their vehicle. So make sure you’re purchasing the correct application for your car. According to Michelin, independent tests show that after 300,000 wipe cycles, the Michelin Stealth Ultra outperformed all industry competitors. These blades are highly recommended for drivers who encounter a lot of ice and snow, since the segmented hardcover helps protect the blade from clogging with road debris, ice, and snow. If you find the Bosch ICON wipers to be too expensive or they don’t have a specific application for your vehicle, the AeroTwin might be a better option for you. Sold as a pair, the AeroTwin wipers feature a blended dual rubber compound with a graphite coating for long life, protected by an aerodynamic all-steel frame. The beam-style blades also feature an asymmetrical wind spoiler for better windshield contact. The Bosch AeroTwin comes with a vehicle-specific pre-mounted adapter that promises to be an exact match to original equipment for easy installation. Since they are sold as a set, you will want to make sure you are purchasing the correct sizes for both wipers. The AeroTwin blades are an attractive mid-range option, priced competitively while offering good performance. They’re recommended for drivers that live in areas that never experience any snow or ice, since the AeroTwin doesn’t sport any special protection from harsh weather conditions. In other words, if season rain is all that you encounter, the AeroTwin replacement blades are a great choice in terms of price and performance. Valeo is a major automotive parts manufacturer in both the aftermarket and OE industry and the 900 Ultimate Series is available in a wide range of sizes ranging from 15 to 29 inches. The 900 Ultimate Series wipers claim to have best-in-class aerodynamics thanks to an integrated spoiler, along with enhanced aero-acoustics that reduce wind noise by up to 3dB for a quieter ride in severe weather. The wiper is a beam-style blade, featuring “Tec3” advanced rubber technology which provides a smoother and quieter wiping performance. And since it’s a frameless wiper blade with no metal structure to collect ice and snow, the Valeo 900 Ultimate Series is a great choice for an all-season wiper. Unfortunately, that also means there’s nothing to protect the blade from repeated harsh weather conditions. Another selling point for the Valeo 900 is the blades feature integrated flexors, providing over 1,500 pressure points for even blade-to-windshield pressure. These are the best beam-style wipers Valeo has to offer and they are priced competitively within the segment. They are recommended for drivers who experience moderate rain, snow, and ice, and ideally can keep their car protected in a garage or other covering when it’s not being driven. If you’re looking for an affordable conventional wiper blade, the ANCO 31-Series is ideal especially if you live in an area that doesn’t experience a lot of rain or snow. The ANCO 31-Series features “DuraKlear” exclusive rubber compound, along with a vented bridge and high-performance polymer for an OE fit. ANCO’s wiper blades also use a “KwikConnect” installation system, making it an easy wiper blade replacement. The 31-Series is available in a wide range of sizes, from 10 inches to 28 inches, almost guaranteeing an application for your vehicle. The company also offers various other blades, including the hybrid Transform blade and the Contour beam blade. These blades are recommended for drivers who need conventional blades and experience moderate rainfall throughout the year. They’re not going to offer the same performance as a hybrid or beam-style blade and won’t endure harsh weather conditions like other competitors. They are essentially a best “bang for the buck” pick, so long as you don’t have to deal with heavy snowfall or ice. TRICO’s Exact Fit lineup of replacement blades are offered in every style: beam, hybrid, conventional, and rear. Designed to be a factory replacement blade, each wiper comes with a pre-assembled connector for quick and easy wiper replacement. The beam blade has been engineered for maximum contact for highly curved windshields, featuring a “Memory Curve Steel” beam that is said to provide uniform pressure for the clearest wipe. The TRICO Exact Fit beam blades are available in lengths from 15 inches to 29 inches. For all-weather applications, the Exact Fit hybrid is manufactured with a high-strength polymer shell, which protects the blade from ice and snow. The hybrid blades are available in lengths from 14 inches to 28 inches. Vehicles with metal conventional wipers that want an original factory quality replacement can opt for the Exact Fit conventional blade, which is available in lengths from 10 inches to 28 inches. And like we mentioned before, don’t neglect your rear window wiper, which TRICO offers in lengths from eight inches to 16 inches. With a large variety of offerings, the TRICO Exact Fit lineup likely has an application that fulfills your needs. Available as a more high-end offering, the SilBlade Premium Silicone boasts a high steel gauge powder coating with long-lasting paint designed to withstand extreme weather conditions. It utilizes a patented silicone rubber blade with graphite and PTFE for smooth operation, superior visibility, and outstanding performance. The formula also leaves an invisible hydrophobic coating, which forms within 90 days from the first use. The blades are designed with as a unique curved frameless wiper blade, conforming to modern curved windshields. They include a patented pre-installed adapter that is designed to fit the vast majority of vehicles. SilBlade’s selling point, however, is that it claims its blades last years, not months, which is why it offers a five-year warranty. The company also offers a 30-day money back guarantee if you’re not satisfied with the quality of the wiper blade. It’s debatable whether the blades actually last years rather than months, and it’s still highly recommended to change out your blades every six months to a year rather than waiting until they fail to perform. The SilBlade Premium Silicone blades are available in sizes from 12 inches through 28 inches. Do they really last for years?